Chicken with Madeira Wine & Porcini Mushrooms is a freezable ready meal from the Waitrose LOVE Life you count range. This is the kind of meal that you might expect to order in a restaurant rather than something you'd regularly cook up at home. The great thing about the Love Life You count range is that the meals are perfectly nutritionally balanced while keeping the calories down. 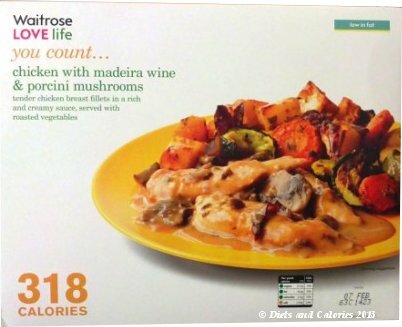 Chicken with Madeira Wine & Porcini Mushrooms is low in fat and saturates and has just 318 calories. Although this ready meal is designed to serve one person, I bought it to share between two people while on a ‘fasting’ day of the 5:2 diet. ‘Tender chicken breast fillets in a rich and creamy sauce, served with roasted vegetables.’ It’s also stated that this meal is made with chicken from carefully selected British farmers. 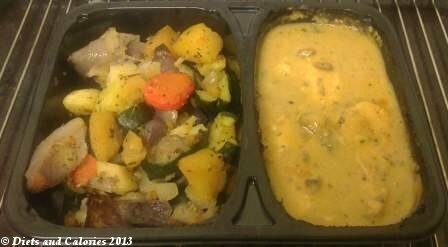 The content are divided into two parts, with the chicken in sauce on one side and a portion of roasted veggies on the other. According to the instructions, you’re supposed to remove the vegetables and put them on a baking tray while piercing holes into the film lid covering the chicken. The whole lot then goes into the oven for 20-25 minutes. I couldn't see why the veggies had to go onto another tray so I just peeled off the film lid completely and left them where they were. I must admit that when I saw the size of the meal, I was worried whether we’d be left hungry. However, I cooked up plenty of low calorie vegetables and also some zero noodles. This is an ideal meal for grownups, and definitely not one the kids would appreciate (well mine wouldn't). The flavours are quite intense and strong enough to add extra flavour to the vegetables I'd cooked. The sauce in the chicken portion is quite thin but that didn’t detract from the flavour at all. In fact, it made it easier spooning it over the vegetables as it went further. There are three reasonable sized pieces of chicken breast and just a few sliced mushrooms. The roast vegetables consist of courgette, carrot, red onion, potato, swede and mushrooms. At the end of the cooking time they were perfectly cooked, slightly crisp on the outside and well cooked in the inside. They’re beautifully seasoned and a surprisingly good accompaniment to the the chicken. All in all, this is a satisfying and tasty meal which got a thumbs up from me and my husband. Found in the chilled cabinets ready meals LOVE Life You Count… section of Waitrose supermarkets. 318 calories for the whole meal and 8 Weight Watchers ProPoints as calculated by Waitrose and provided for informational purposes only. Nutrition information pe380g pack: 318 calories, 27.4g protein, 30.6g carbohydrate, 12.3g sugars, 8.3g fat, 2.5g saturates, 6.1g fibre, 0.57g sodium.